When purchasing tickets, it’s as easy as going to http://www.erieevents.com, click on Buy Tickets in the top right corner and then select the show you want to buy tickets for. 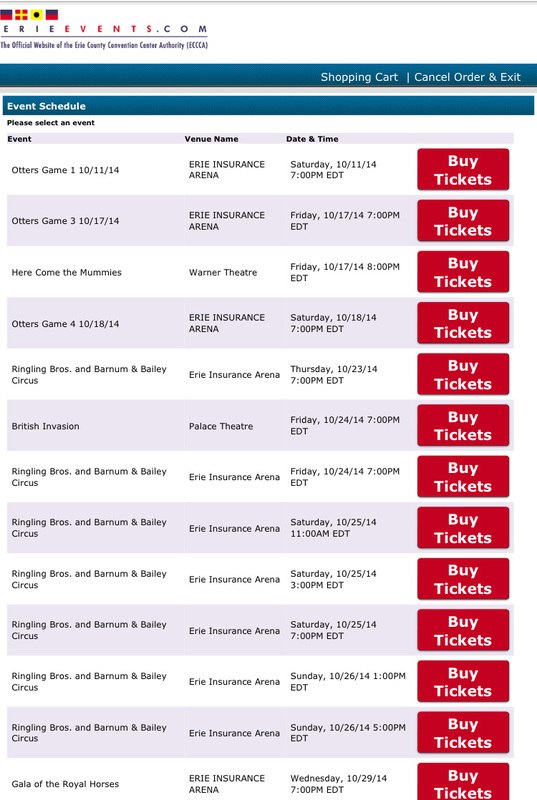 The only authorized sales agents for the Erie Insurance Arena is the Erie Insurance Arena Box Office. Tickets purchased from any other source may not be valid. The Erie Insurance Arena box office is not able to honor, replace or refund invalid tickets. Invalid barcodes must be confiscated by the box office and a copy of the tickets will be provided at the customer’s request. The copy of the invalid tickets may be used to alert the point of purchase. Other resellers may offer money-back guarantees, but they are unable to guarantee entry to an event as they are not able to validate that ticket or seat location is authentic. Customers with invalid tickets are welcome to purchase replacement tickets, but seating location and/or price is based upon availability. Customers should report fraudulent ticket sales to the point of purchase and consumer protection agencies. The following contact information is provided for your convenience.